I am now offering the latest and healthiest Brazilian Keratin straightening treatment. This Keratin treatment is formaldehyde free, enriched with vitamins from plants, apple pulp, and vanilla, and eliminates frizz, leaving the hair silky smooth. It is so gentle, you can color and highlight your hair on the same day. In addition, this Keratin treatment protects your hair from the heat of the blow-dryer and cuts blow-drying time by 50%. I believe you can be a hairdresser without using harsh chemicals and get amazing results. I highly recommend this product for everyone. Surprisingly, people with not only curly hair, but also with straight hair can use this product as a conditioning treatment. Perfection SmoothOut can last up to four months and it is formaldehyde free. Perfection employs amino acids a heat protective polymer and a reducing catalyst that is activated with heat to allow the solution to penetrate the hair fiber and to suspend the hair's textural memory. What's great about Perfection is you can get your hair straighten and colored on the same day and wash it again that same day. No waiting to wash like many of the other straightening products. 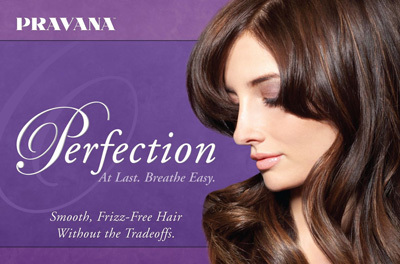 Plus, there is no keratin in Pravana Perfection.